The Schwinn Fitness AC Performance Plus bike has some of the best features in the market. It is light, and with a length of 127cm and a width of 53cm, it is perfect for in-home use. This Schwinn bike is low maintenance and has a six magnet braking system. The outstanding features make this bike a great investment in the long run. The seats and handlebars are easy to modify. This bike can be assembled in under 60 minutes. It is also very stable with four levelers in the stabilized bar. Ultimately, if you are looking to lose some weight or just keeping fit, this bike is an excellent choice. Looking for a spin bike in a different price range? Check out our Spin Bike Buyer’s Guide for more options. The Schwinn AC Performance Plus is built by one of the oldest and most reputable bike companies in the world. The company has over 100 years of experience producing high-end bikes and cycling-related equipment. It was founded in 1860 by Engineer Ignaz Schwinn and later sold to Pacific Cycle in 2001 after it was declared bankrupt. Pacific Cycles was later purchased by Dorel Industries. However, through the two acquisitions, the Schwinn brand has remained intact. The company specializes in kids’ bikes, adult bikes, recreation products, and home and commercial exercise equipment. The Schwinn brand has been—and still is—one of the most preferred brands in the US in regards to mountain bikes, tandem bikes, electric bikes, hybrid bikes, and cruiser bikes. 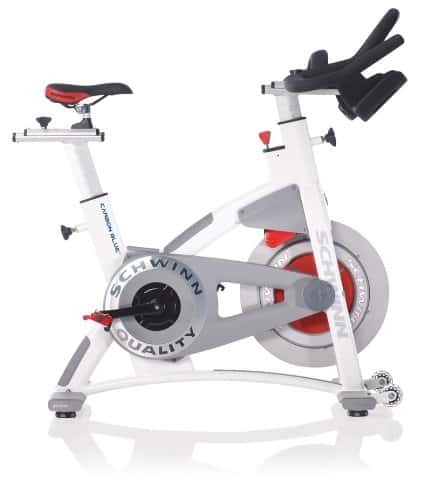 The Schwinn Fitness AC Performance Plus is a favorite in gyms, at studio workout sessions, and in residential settings. It is silent. The latest carbon blue belt ensures a smooth and quiet workout during the day or at night. The Schwinn bikes’ 6 magnet braking system creates the real cycling experience. The resistance adjustment brings the magnets close to the flywheel. You will feel like you are cycling up a real hill. Decreasing the resistance with the knob moves the magnet away from the flywheel and eases the resistance. This system protects our brakes from wearing out. You can also work out comfortably knowing that the AC Performance Plus comes with one of the better warranties in its class. A ten-year warranty on the frame and five-years on corrosion will give you peace of mind in knowing your investment is protected for the long haul. Schwinn’s impressive warranty also lends credence to the company’s confidence in their product. The Schwinn AC Performance Plus indoor cycling bike is easy to assemble and adjust. Even the most technically-challenged can have their bike ready to be used in under an hour or so. The handlebars are light, and the seat can be adjusted easily. The aluminum frame is rust free and light compared to other materials. You can move your bike from one room to another with ease. After a workout, all you need is to wipe off the sweat with a towel. And, its size and dimensions are favorable for small spaces. Many people, however, frown at the price of this bike. The bike goes for around $ 2,000. This amount won’t sit well with most users, and if that’s the case for you, there are worthy options at lower price points. However, you will want to consider the value of the durability of the bike and the warranty it comes with and weigh that into your decision. One big downside is that the cycle doesn’t have an onboard console to track progress in the middle of the workout. The lack of a console is a major factor to consider while purchasing your bike. A console gives you some added motivation and shows the progress you’ve made during your workout. However, a separate tracking machine can be bought and installed to track the calories burnt, the heart rate and time. The Schwinn spin bike features an aluminum frame that keeps it rust free and light as compared to steel and other commonly used materials. The strength and sturdiness are superb, so you do not have to worry about it malfunctioning during your work out. There are four levelers under the stabilizer that can be adjusted in case of shakiness during a vigorous workout. The Schwinn Fitness AC Performance Plus indoor cycling bike is 130cm in height, 53cm in width, and 127cm in length. The cycle also uses a superior six-magnet braking system. The magnets prevent the brakes from wearing out and gives the bike a more authentic feel. With an easy-to-adjust seat and handlebars, finding a comfortable riding position can be achieved by most users. The Performance Plus comes with a 37-pound flywheel that is capable of delivering a real cycling experience. The cycle weighs 51kgs and can accommodate a maximum of 159kgs of user weight. As for the drive belt, the AC Performance Plus comes with a carbon blue belt or a chain belt. The carbon blue is preferred for its quietness. The chain belt is great, but it can be a little noisy. The seats are padded and wide for maximum comfort. The handlebars have two inbuilt water bottle holders. The Schwinn bike has ten years warranty on the frame, five years warranty on corrosion, two years warranty on the mechanical parts, one year of labor warranty and six months on wear parts like the pedals. If you have a big budget, you have to seriously consider this cycle. The Schwinn AC Performance Plus indoor cycle is a bike that will last a long time and take minimal maintenance. And, despite its high price tag, it has enough advantages to outweigh the big investment. The stability and smoothness of this bike are undisputed. And, with the option to use the carbon blue belt (rather than the standard chain belt) you can ensure quiet operation as well. This bike can be assembled and ready to use in under an hour, and it is light and can be easily transported from location to location. Ultimately, with great features and a superior warranty, the AC Performance Plus is a bike worth looking at for buyers who have a big budget.